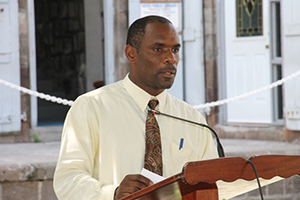 NIA CHARLESTOWN NEVIS (October 15, 2014) –Permanent Secretary in the Ministry of Finance on Nevis Collin Dore, publicly commended the Department of Statistics and Economic Planning for what he described as a bold step to build community awareness on the need for statistical data. “As you are well aware, statistical data is very important to the development of every country. As a small developing nation, it is even much more important as it is difficult at times to assess the steps we would have made as a country, if we are not able to put these into quantitative terms,” he said. According to Dore, the Department was faced with an increasingly analytical population, whose demand was for more conclusive information. It no longer wanted to rely on lengthy speeches that was not supported by the relevant data. It was for that reason, he noted, the job of the Department had become more critical and he underscored the need for more accurate and timely data reporting and explained what statistics meant. “Statistics is the study of the collection, analysis, interpretation, presentation and organization of data. Data has got to be relevant if it is to be of any benefit to the end user. You must realise that statistics touches everyone, from the ordinary man on the street who relies on price data for his everyday shopping as a means of getting the most from his dollar to the investor who is concerned with market data. “It is therefore imperative that we continue to provide the statistical data in a user-friendly manner that benefits all. 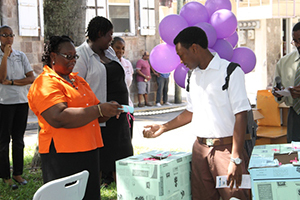 The Statistical Digest 2014 which will be distributed today is a welcome step in this awareness process,” he said. Dore added that the Ministry of Finance was fully committed to promoting an active and reliable Statistical Unit which boasts of timely and accurate reporting to the public on a regular basis and the Digest would provide that information. “Such publication will provide tangible evidence that shows the fiscal and economic policies implemented are actually bearing fruits as we seek to turn our economy around following the stagnant growth of the earlier recession period,” he said.